On October 3, 2016, federal officials posted the 2016 Transitional Reinsurance Program Annual Enrollment Contributions Form that health insurers and self-funded plan sponsors (employers) will use to make required payments under the Transitional Reinsurance Program (TRP). The 2016 report is due no later than November 15, 2016. The Affordable Care Act (ACA) prohibits insurers from rejecting applicants based on their health status or pre-existing conditions. To spread the financial risk of this change across insurance markets, the ACA also established the Transitional Reinsurance Program (TRP). The program raises revenue to help fund high-risk insurance pools by imposing a mandatory contribution on health insurers and employers with self-funded health plans (contributing entities). Contributions are collected annually for each calendar year from 2014 through 2016. Insurers and health maintenance organizations (HMOs) are responsible for reporting and paying the reinsurance contribution for insured plans. The employer policyholder does not have any duties under the TRP for any group insurance plans. For self-funded health plans, however, the plan sponsor (employer) is responsible for reporting its enrollment count and paying the appropriate contribution. Although a third-party administrator may handle duties on behalf of the self-funded plan, the employer as plan sponsor remains responsible for accuracy and timeliness. The reinsurance contribution applies only to health plans that provide minimum value. To confirm whether a particular plan provides minimum value, refer to the plan’s Summary of Benefits and Coverage (SBC). Minimum value plans typically are major medical and HMO plans that provide benefits covering at least 60 percent of allowable costs. Stand-alone dental and/or vision plans. Health flexible spending accounts (FSAs). Integrated health reimbursement arrangements (HRAs). 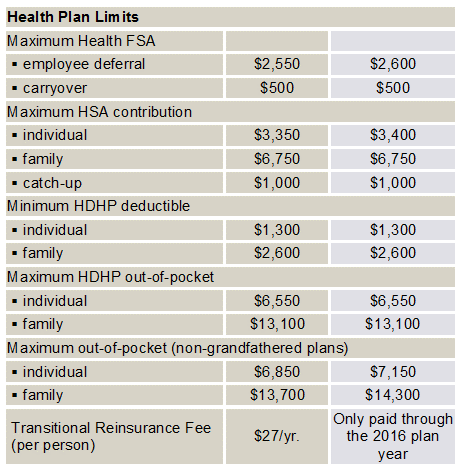 For 2015 and 2016 only, group health plans that are both self-funded and self-administered are exempt from the reinsurance contribution requirement. Plans that do not use a third-party administrator for “core administrative functions,” such as claims processing or adjudication or plan enrollment, may qualify for the exception. The majority of self-funded, self-administered plans are union trust plans, so this exception is not widely available outside of the multi-employer plan environment. The form automatically calculates the plan’s required annual reinsurance contribution based on the enrollment count. To complete the form, entities also must enter payment information (e.g., bank account info) and schedule their payment dates(s). The two payment schedule options are to pay the total contribution by January 17, 2017, or to pay in two installments by January 17, 2017 and November 15, 2017. These three methods are similar to the methods used to determine the Patient-Centered Outcomes Research Institute (PCORI) fee. For the reinsurance contribution, however, the actual count and snapshot count methods are based on enrollment in the first nine months of the calendar year, regardless of when the health plan year begins and ends. Employers may use Employee Retirement Income Security Act (ERISA) plan assets (e.g., employee contributions) to pay some or all of the plan’s reinsurance contribution. By November 15, 2016, submit enrollment count and schedule payment date(s). If paying 2016 amount in single installment: $27 per covered life. If paying in two installments: $21.60 per covered life. By November 15, 2017, remit 2016 contribution (second installment, if any): $5.40 per covered life. For step-by-step instructions to complete the 2016 Form, register on the CMS REGTAP page, and then search for “2016 Reinsurance Contributions.”. This web-based training was developed by the Centers for Medicare & Medicaid Services (CMS), the federal agency responsible for the TRP, to assist contributing entities. CMS also will respond to specific questions sent to ReinsuranceContributions@cms.hhs.gov. Entities are encouraged to allow enough time to review the training site and understand the requirements. Entities that made reinsurance contributions for 2015 are familiar with the process. Entities that are responsible for the first time this year should not wait until November to begin preparing their submission. Also, if reporting for four or more entities, supporting documentation will be required and must be submitted using specific file formats. Employers, brokers, and other interested parties may access the web-based training site at https://www.regtap.info/index.php. The deadline for contributing entities to complete the 2016 form is November 15, 2016.